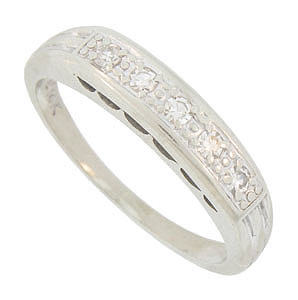 This classic 14K white gold wedding band is frosted with a row of glittering round diamonds. 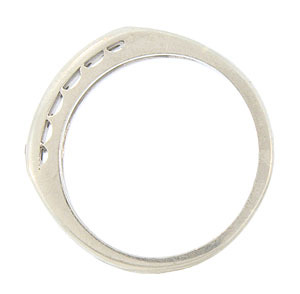 The face of the ring is embellished with abstract engraving and decorative milgrain detailing. Large scalloped cutwork ornaments the rings sides. The Retro Moderne wedding measures 4.21 mm in width. Circa: 1940. Size 5 1/2. We can re-size.